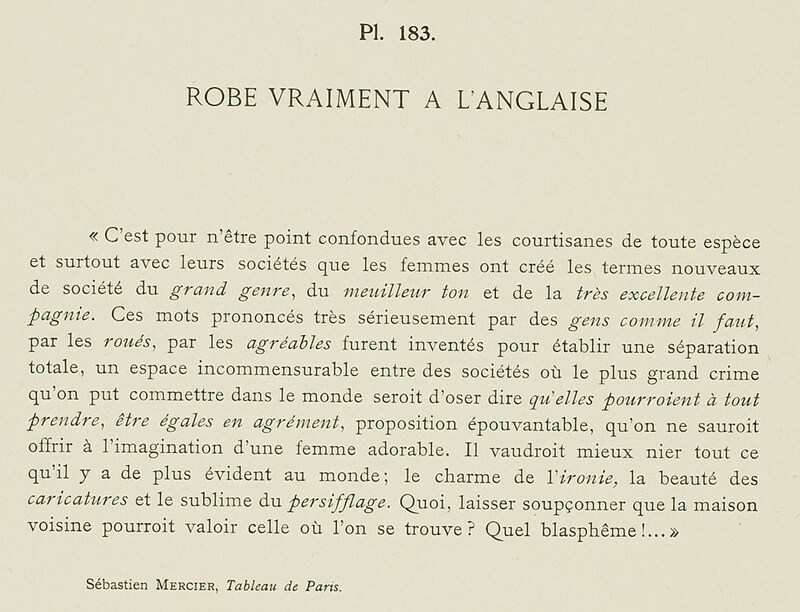 "It is to avoid being confused with courtesans of all types and overall with their company that women have created the new terms for society such as grand genre, meilleur ton, and the très excellente compagnie. 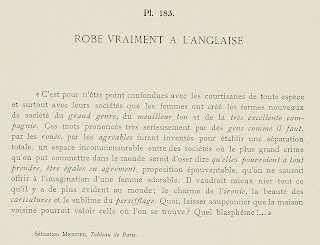 These words, pronounced very seriously by the comme il faut people, by the roués, by the agreeable people, were invented to establish a total separation, an immeasurable space between the societies where the greatest crime that can be committed in the world would be to dare to say that they could take to everyone, to be equal in agreement, an appalling proposition that one could not imaginably offer to an adorable woman. It would be best to deny everything that was more evident to the world: the charm of irony, the beauty of caricatures and the sublimeness of banter. What, suspect that the house next door could argue that where you are? What blasphemy! ..."
This plate is super interesting. Her dress, hair, and hat are of course very nice, but it's her little meal that draws my attention. She is eating unshaped rolls, or buns or breads, and another which may be squared, like a shortbread or something. There is a tray, perhaps of china, with what appear to be articulated sides, and inside a bunched napkin, which may hold more breads. There's a knife near the edge of the table. I cannot tell if she's drinking tea or coffee...or maybe chocolate. The accoutrements don't include the stirrer/frother thingie that would point to chocolate. Teacups could have straight up and down sides, and saucers were often deep, as here. There is a spoon in her saucer. There is a jug for what I assume is cream. The table may have a marble top, but it does appear that the raised table edge is made of brass. In these years either tea or coffee would be common. 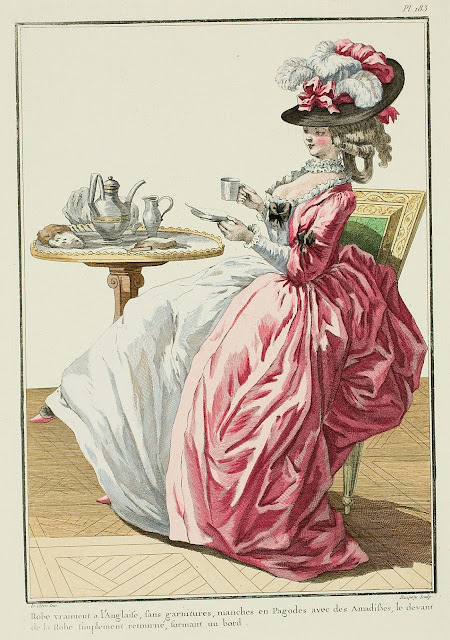 Fanny Burney had both a coffee time and a tea time each day when she served at Court. I know that she often had a roll at breakfast, which she often crammed down, being in a hurry to run to her royal mistress for the latter's dressing. I know that in America women often wore hats inside at gatherings; inside at home or at Court in everyday situations, one wore a cap, and then a hat outdoors. It's hard to tell if the lady here in question is part of a gathering or in public...being unaccompanied I would fancy she would NOT be in public, unless she were part of the demi-monde. The accompanying text makes me think that she is part of the demi-monde. Wow, Natalie! I honestly had not thought much about her meal until now. What a very thorough analysis. I've got no clue as to the woman's standing in society. My guess would be that she's meant to be upper-middle class, though - most of the time, if a woman's supposed to have a specific position (governess, lady of the court, etc. ), it's mentioned.